By the passage of time, you may find a lot of amazing dresses which are the amalgamation of rich African tribal designs. 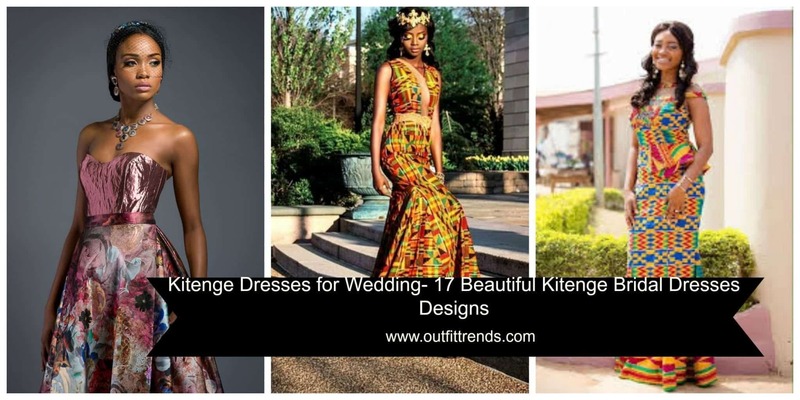 Although it may be hard to find old traditional bridal attire of Kitenge, but the good news is that it has reached to the high street fashion trends which are fabulous in look and irresistible to opt for your big day! Kitenge originally means a kind of fabric that purely belonged to various parts of the continent of Africa. It was traditionally used by women for clothes designs or head scarves. These clothes had bright prints or patterns which used to traditional or religious designs. We’ve already discussed Modern Kitenge Dresses that are trending these days, so now we’ll be focusing specifically on bridal looks. In the modern age, the Kitenge is being utilized and experimented in a variety of ways and the versatility that it projects is unbounded. Especially, the designers of bridal wear have intermixed the modern and traditional designs and patterns to bring out the uniqueness inherent in it. There are various amazing bridal dresses designs that carry a western look but keep the close relation to the old African culture. Kitenge is the top most priority for the bridal wear designers because of versatility in colors, patterns and designs. The bride who opts to wear Kitenge is the most vibrant and ravishing bride. The things to remember while selecting the suitable Kitenge for your big day is to choose the dress which is not only comfortable and stylish but also carries a feminine look and is well fitted too. The Aso Ebi Bella presents a style of wedding gown which is meant to make you stand out of the rest. The vibrant combination of colors and a style and design makes it a perfect combo of Kitenge and latest trendy Nigerian bridal dress style. In order to make your big day a most memorable a couple can decide to wear alike color combination or pattern. It looks extremely adorable and eye catching too. The most ethnically inspired gown which is sleeveless and has a delicate kitenge trim. African and Tanzanian Ankara gown is a latest and trendy variation of Western style with African traditional Kitenge style. The plain silky red skirt with rust and green bodice gives it a jaw dropping attention. Sunflower color and pattern is a traditional fabric design of African brides. This lovely yellow Ankara gown style is a perfect example of modern and trendy with ancient traditions of Kitenge dress for brides. The black net back design gives it an in vogue style. The black net at the bodice looks awesome with the long maxi style of fresh colored Kitenge bridal outfit. It’s both stylish and vibrant so looks like a perfect wedding attire. When you decide to wear long maxi or Ankara style of outfit you must keep in view that your shoes should be high heels to get on with the required look and elongate the legs. It can look the best for the slightly plus sized brides as its perfect fitted design gives you a sleek or slim look. Mermaid style has always been most popular and ranked top in fashion catalog due to its elegance and delicacy. There are a lot many variations done by different designers but the concept remains the same. Most famous Kitenge bridal outfit style for an African bride is beautifully flowing mermaid dress. It can be wished to be designed with sleeves or without sleeves but the layers at the bottom give an ethereal feel. The blend of Eastern and African wedding attire gives out a perfect example in the form of this stunning wedding outfit. A rust or gold neck strap gown style with a vivid contrast color is more than just chic for the wedding day. If you desire to wear a unique multicultural apparel with a strong sense of inspiration from the African tradition, this style is what you are actually looking for! Out favorite hairstyle that looks best with Kitenge outfits is the dreadlock hairstyle. You can also check out Top 20 Dreadlock Hairstyles Trends for Girls These Days. The mermaid style is the ultimate love of African brides and a printed plain fabric with lace on top looks amazing indeed. This is a designer wear by Elisha Red Label and gives the most modern look to the bride because of its intense and detailed embroidery and delicate layers below. The regular Kitenge outfit can be modernized with an addition of various patterns and latest styles and cut. Yet another mermaid dress theme with a unique layer of fabric just below the waist! I really love that maroon dress the layered lace mix. Can I have it? What are the requirents for it to reach me by 15th December?